When a slice of a Michelin-starred enterprise arrives, you’ll bet Melbournians will be lining up. Tim Ho Wan was set to open early last year but almost a year later did the doors finally open. 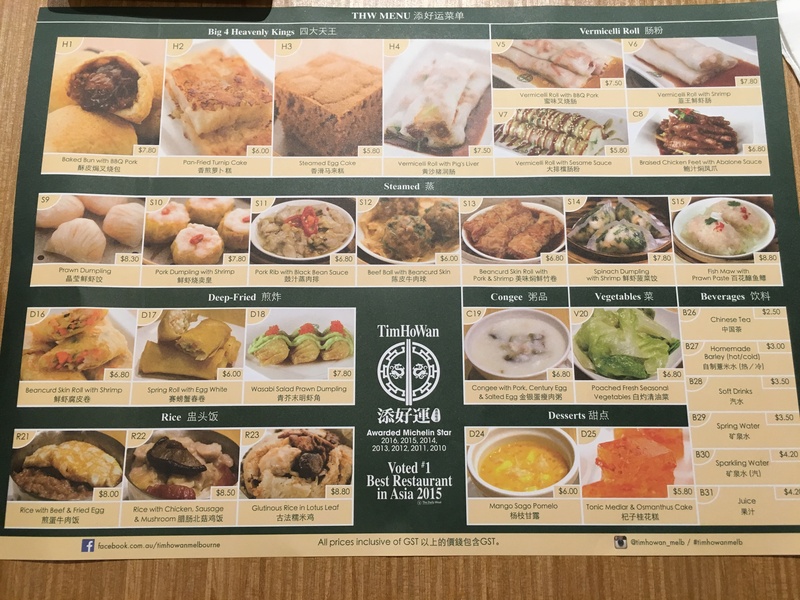 Opened in 2009 in Hong Kong, the first Tim Ho Wan earned its Michelin star in 2010, expanded into five restaurants in Hong Kong, and in more recent years has opened shop in other south-east Asian countries. There are already four in Sydney but their first shop opened in Melbourne in March. Literally translated, “Tim Ho Wan” means something along the lines of “add good luck” (even though I always thought it was someone’s name, and I nicknamed them “Tim”). At midday, there was a huge line outside, snaking through the arcade (I couldn’t really see the end of the line, in fact). I went with people who were acquainted with someone in Tim Ho Wan – I was lucky enough to tag along. For that reason, I cannot be certain we might have been treated with more care. The service we received was attentive, but quick and efficient as it should be for dim sum. The restaurant is not small but also not big, with very simple decor and table and seats. Customers fill out their order on a checklist, the staff confirms the order and then the dishes come out. It’s all dim sum dishes but the atmosphere is less “yum cha”. Thankfully the food didn’t all come at once and were decently staggered. Several dishes might come out of the kitchen at once but we were able to work through them and keep up. Portions were dim sum sized but prices much higher. While the food usually tastes identical at most dim sum restaurants (at least here in Melbourne), it was clear to me that they make their own food and had some unique recipes. Everything tasted just a little bit different to everywhere else. 25 items is rather low for dim sum, but if care is taken for each dish and prepared in house, then indeed they stand out from the rest. We managed to try just about every dish! My highlights included the famous baked bun with BBQ pork and spinach dumpling with shrimp. Some more “abnormal” ones in the world of dim sum were too weird for me, like the vermicelli roll with sesame sauce. Tim Ho Wan is every bit a dim sum restaurant. It’s noisy, there are people everywhere and it’s fast paced. That’s how it should be. The dim sum is quite good (just a little bit different and a little bit refined), and I think this is reflected in the higher prices. Australia doesn’t have a Michelin guide so the hype (and long lines) for this Tim Ho Wan offspring will certainly last a long time.